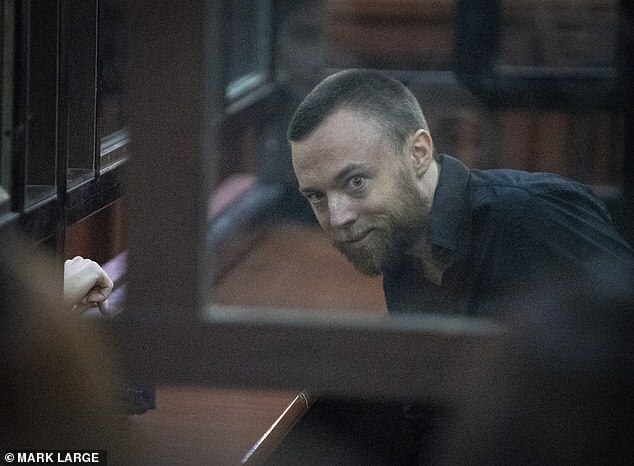 Speedboat killer Jack Shepherd is on his way back to face justice in the UK. 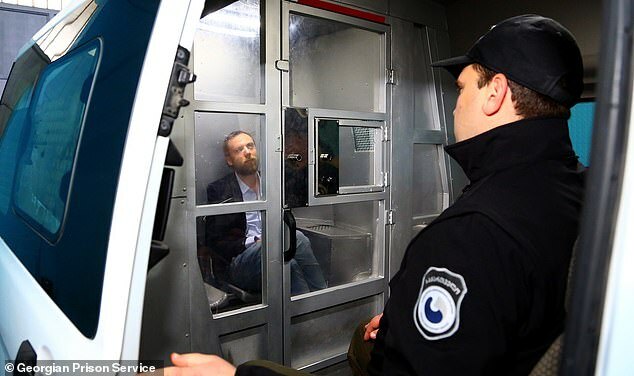 The fugitive was handcuffed as he was led aboard a Georgian Airways flight to London Gatwick. 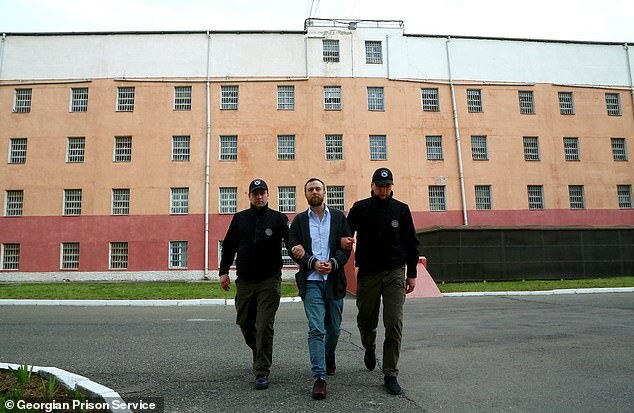 Flanked by Georgian prison guards officers, he looked grim faced as he departed the cell where he has been locked up since being arrested in January. 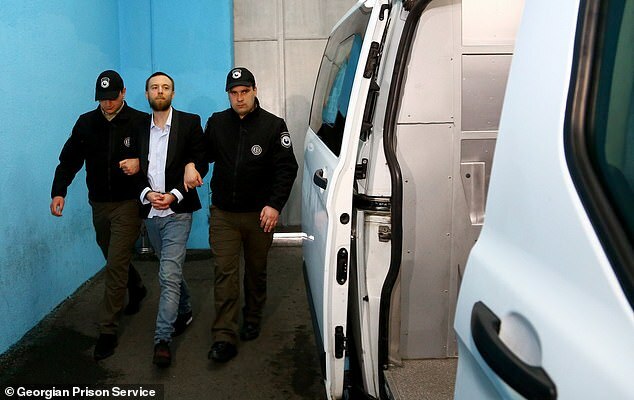 Wearing an open neck white shirt, navy blazer and blue jeans, he was taken by prison van to the airport where he was handed over to the custody of two Metropolitan Police officers for the flight to London. 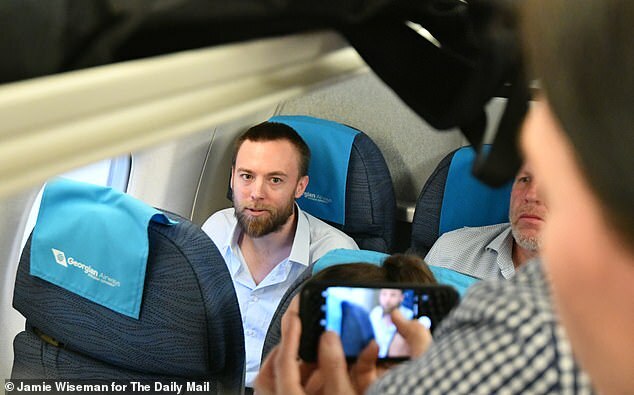 On board the flight from Tbilisi today, Shepherd told reporters he 'wasn't thinking' when he went on the run just before his manslaughter trial last August. Shepherd, 31, is expected to appear at the Old Bailey in London tomorrow. 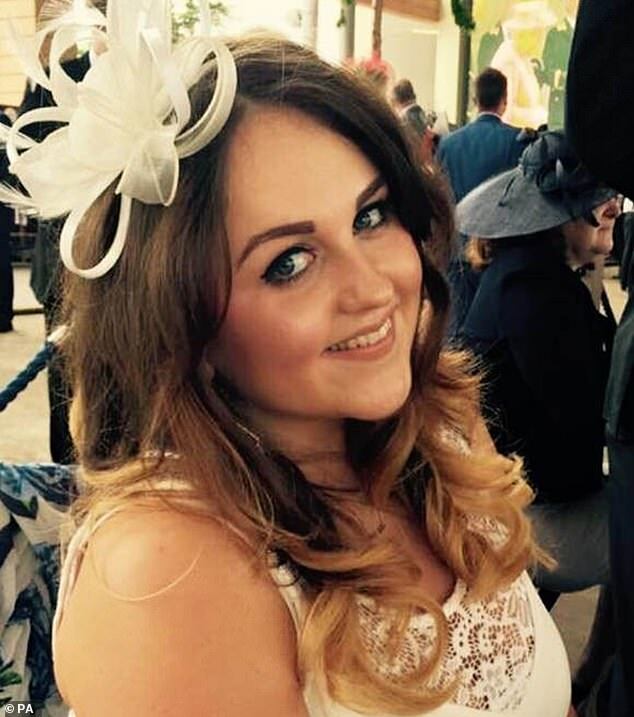 He will be sent to jail to belatedly start his six-year jail sentence for the manslaughter of Miss Brown, who died when his speedboat flipped on the River Thames on their first date. He could also face extra jail time for his decision to run away. He skipped bail ahead of his Old Bailey trial last year and fled to Georgia where he began a new life in the former Soviet republic. 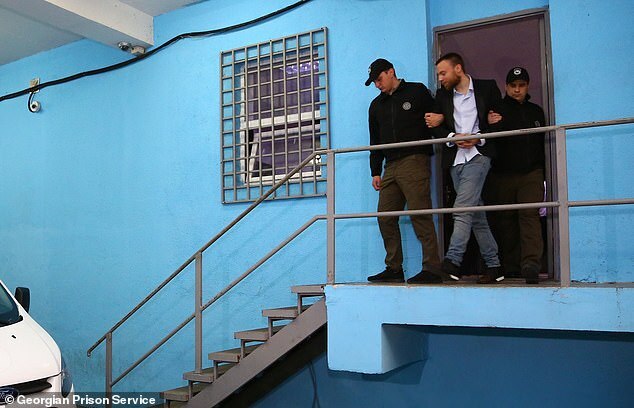 The trial went ahead without him and a jury found him guilty of manslaughter by gross negligence because his speedboat was defective and Shepherd – who styled himself 'Captain Jack' - was drunk when it capsized. Shepherd was on the run for 10 months until a Mail investigation tracked him down in Georgia. He handed himself in to police on January 23, but spent two months fighting extradition, saying he wanted to stay in Georgia, where he found a glamorous new girlfriend, amateur model Maiko Tchanturidze, 24, who is the same age as Miss Brown when she died. Amateur model Miss Tchanturidze, 24, declared she would wait for Shepherd and would apply for a visa to visit him in jail in London. Shepherd, who is married with a young son, will appear at the Old Bailey on Thursday where a judge is expected to order him to belatedly start his six-year sentence for the manslaughter of Miss Brown. 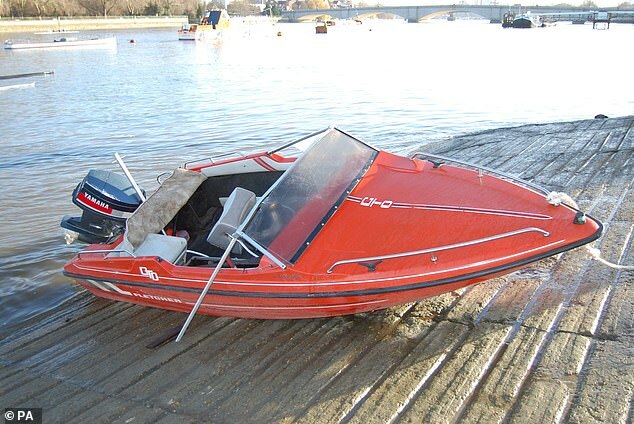 The business consultant, from Clacton, Essex, died on her first date with Shepherd in December 2015 when he took her for a drunken ride in his defective speedboat which flipped on the Thames. Web designer Shepherd fled to Georgia ahead of his trial last July, and was convicted in his absence. 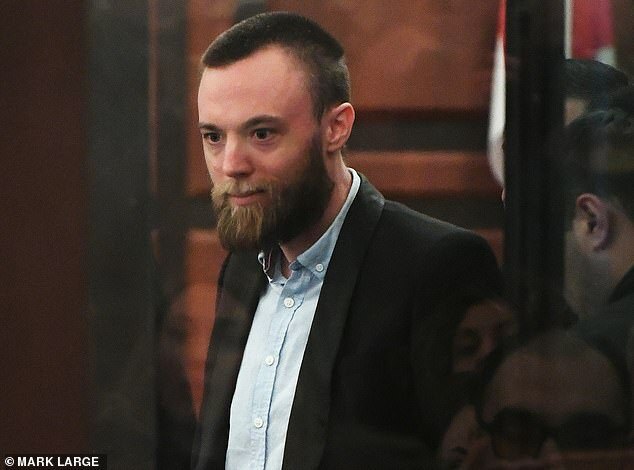 He caused outrage by launching an appeal – funded by legal aid – from his hideaway and the Daily Mail offered a £25,000 reward in the hunt to find him. Shepherd started dating Miss Tchanturidze, a former TV journalist, within weeks of his arrival in the former Soviet republic, but neglected to tell her he was a wanted fugitive. 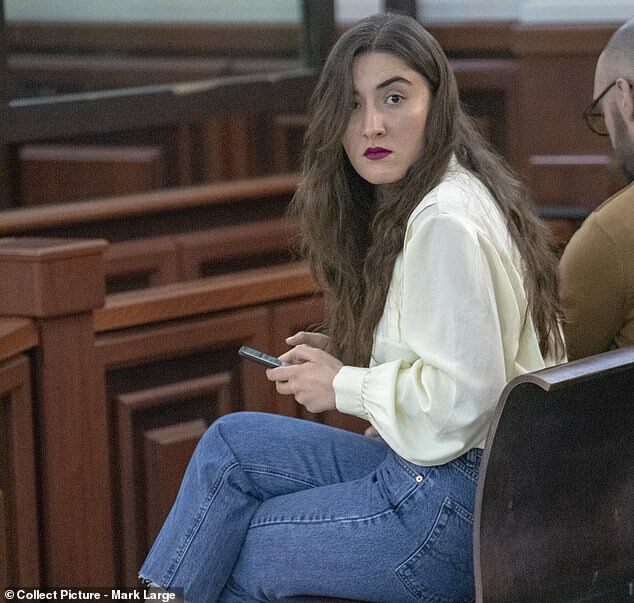 After eight months together, he tearfully confessed to being a convicted killer shortly before handing himself in to police on January 23, but told her the accident was not his fault. Yesterday she said: 'I will definitely stand by him. I can't wait to see him again. Jack is fearful about what will happen, but he is holding it together. Today Shepherd's glamorous Georgian lawyer Mariam Kublashvili also paid him a final visit. No date has yet been set for Shepherd's appeal, which is based on perceived legal errors made by the judge in relation to his police interview. He has issued a reluctant apology to Miss Brown's parents but still blames her, insisting she was driving at the time the speedboat capsized. Whenever he is free again, he has said he will not return to his wife but wants to secure access to his two-year-old son. Sun 29° Aries 01' 34"
Moon 27° Libra 46' 50"
Mercury 02° Aries 39' 58"
Venus 28° Pisces 25' 37"
Mars 12° Gemini 35' 31"
Uranus 02° Taurus 19' 19"